Rugged wind sensor handles speeds from 5 to over 125 mph. Reed switch/magnet provides one pulse per rotation. Comes with exterior grade wire (click add to cart to see standard wire lengths), custom lengths available on request. It is designed to provide very accuracy at an affordable price - with a sapphire/tungsten carbide bearing system for super low friction and long life. 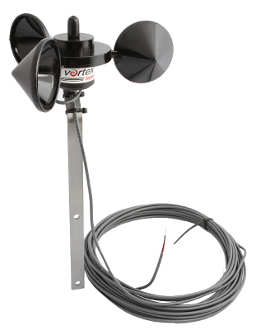 The Inspeed wind sensor is great for do-it-yourself projects, replacement, or additional parts. Mounting pole not included.